The closure of the Severn Tunnel at weekends during the spring of 2000 resulted in the 6M68 08:45 Burngullow to Warrington Arpley china clay tanks being diverted via the Lickey Incline. 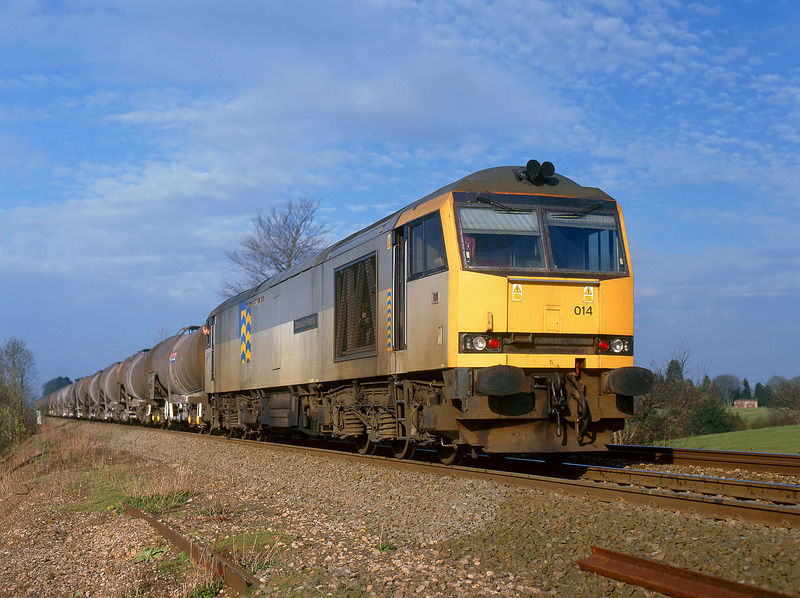 Due the load being in excess of the Class 66's meagre haulage capacity, a banker was provided. On 8 April 2000, 60014 Alexander Fleming is pictured half way up the formidable gradient at Vigo, giving the train a hefty push from the rear. In this case the train loco was 66053. There are not many vantage points on the incline to photograph the rear end of a train going up the bank in the evening, but this seems to work quite well, and I deliberately included a large area of sky in the picture to show off the interesting cloud formation.